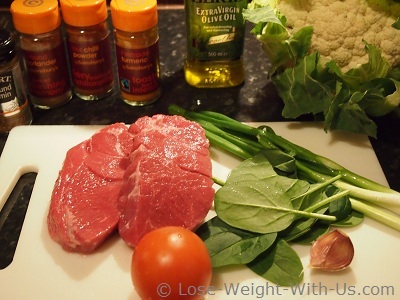 This is a lovely low carb lamb curry recipe. Indian spices add warming flavors to this simply wonderful and satisfying supper. All your family will enjoy this Indian lamb curry recipe. This curry goes very well with cauliflower rice (find the recipe below), though it can be served on its own. The cauliflower rice is a great low carb substitute for normal rice, it contains only 36 calories and 3.9g of net carbs in one portion. 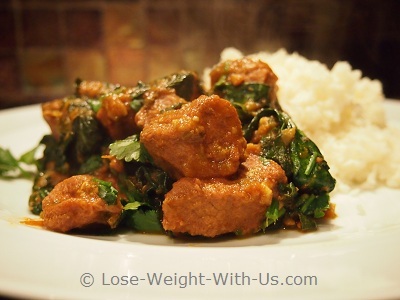 There are 290 calories and 6g of net carbs in 1 serving of lamb curry with spinach. Recipe Nutritional Profile: Diabetes Appropriate, Dairy Free, Healthy Weight, Heart Healthy, High Fiber, High Protein, High Potassium, Low Calories, Low Carbs, Low GI, Low Sodium, Low Saturated Fat, Good Source of Iron, Folate, Magnesium, Manganese, Niacin, Phosphorus, Thiamin, Zinc, Vitamin A, B-12, B-6 and C.
Heat 1 tbsp. of olive oil in a large frying pan over a medium heat, then add onion, garlic and fry for 2 min until the onions become soft. 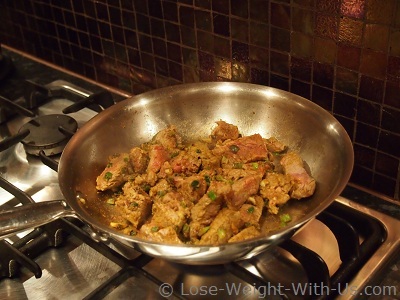 Add ground ginger, cumin, coriander, turmeric, chilli powder and salt and cook for a few minutes. 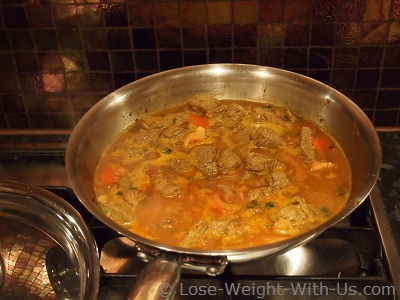 Add the lamb and keep stirring the meat until browned. Stir in the tomato, tomato puree, 1 cup of water, then bring to the boil, reduce the heat, cover with a lid and let it simmer for 1 hour. You might need to add a bit more water during cooking. 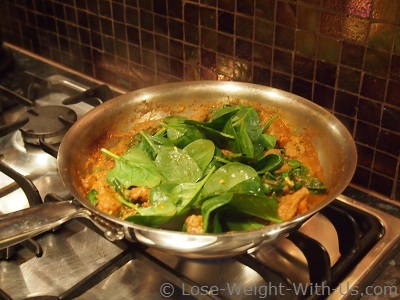 Add the spinach and continue to cook for another 10 min. Serve hot with cauliflower rice - the recipe is given below. Use a grater or food processor to finely dice the cauliflower, so it looks like rice. Fill a medium pan with 2cm of water, add salt. Bring to the boil and add the cauliflower. Cook the cauliflower rice for 2 min, then drain well through a sieve and serve straight away. 36 Calories, 43mg Sodium, 435mg Potassium, 7.5g Total Carbohydrates, 3.6g Dietary Fiber, 2.8g Protein, 16% Vitamin B-6, 111% Vitamin C, 21% Folate.